Note: The following is a two-part article I wrote for the WISE Division's Owl Car newsletter in 2000 to commemorate the 50th Anniversary of the NMRA Speedrail wreck in Milwaukee on Labor Day weekend of 1950. I have since made some minor updates as new information has become available. Also, The Transport Company Web Station has added a number of pictures to their site which I have linked to. I thank them for sharing these images so others can get an idea of what Speedrail looked like. There is also a fascinating video about the wreck from the Butterworth family, which you can find by clicking on the button. Labor Day weekend 1950 started out as a weekend of celebration for many reasons. It was the one-year anniversary of Speedrail and its interurban transit line. And it marked the 15th Anniversary of the NMRA which brought its convention to the Schroeder Hotel (now the Hilton) in Milwaukee - the third time the association had come home to the city where it was formed in 1935. But by the time the weekend was over, it would change the lives of many NMRA members, and even the future of interurban service in Milwaukee. The history of Speedrail, and local interurban operations, has been well covered in other publications, such as Speedrail, by Larry Sakar, and TM, by the Central Electric Railfans Association, Inc. Both were referenced for this article as well as the Milwaukee Journal from the week after the wreck. Speedrail began to take formation in 1949 when a group of Milwaukee and Cleveland investors, headed by Jay Maeder of Cleveland (who was also a railfan), purchased control of the Milwaukee-Waukesha operations as well as the Hales Corners branch effective September 2, 1949. Cost-cutting measures with equipment and operations were paying off, and the line's future looked better. And on December 2, 1949, the Milwaukee Rapid Transit and Speedrail Company had become official. The NMRA convention ran September 1-4, 1950 and was busy with about 660 delegates attending. A number of clinics were presented over the weekend, along with a pair of "Ladies bus trips". A Saturday-evening banquet and a 15th Anniversary Party on Sunday evening were to cap the activities of those busy days. Manufacturers on tour included Globe Models, Model Railroader magazine, and Wm. K. Walthers. There were also three club layouts on tour; the O scale Model Railroad Club of Milwaukee, (which still exists in the same location today), the Milwaukee HO Gaugers (the Indian Head Lines), and the O scale Rigor Mortis Model Railroad & Pinochle Society, along with three O scale and two HO scale home layouts. Those attending the convention had options for excursions on the clear Saturday morning of September 2. There was a trip over the Milwaukee Road's Beer Line and shop tour which had around 200 participants. For Speedrail, there were five chartered round-trips from Milwaukee to Hales Corners with 436 riding those trips. The single-track from West Junction to Hales Corners had never seen that much traffic at one time, and two extra men were on duty to supervise safety and dispatching. Raymond Krat, 32, Chicago, Ill.
Marian Krat (wife), 25, Chicago, Ill.
John Williams, 32, Park Ridge, Ill.
Emil Henry Beck, 51, Detroit, Mich.
Huntly G. Burroughs, 42, Detroit, Mich.
Charles J. Sulzbach, 23, Minneapolis, Minn.
William Roberts, 42, Taylors, S.C.
News of the Speedrail wreck spread quickly. A taxi driver had witnessed the wreck and radioed his dispatcher for help. Soon network radio broadcasts spread the news nationally, and it became front-page news in the Milwaukee newspapers for days. The NMRA, and Speedrail, were unexpectedly in the spotlight. Word reached the Schroeder Hotel around 10:30 a.m., and members started calling home to let their families know they were not in the wreck. Most of the injured were taken to County General with some taken to Milwaukee Emergency Hospital. One of the injured was Harry Bondurant, a charter member from Wauwatosa and the first secretary of the Association who also started the process of creating the NMRA standards, who suffered serious injuries and was hospitalized for months. A sign on the bulletin board at the hotel read, "Please do not go home. There are fellow model railroaders who need our help." And members responded. A request for 100 blood donors was posted at the hotel, and there was no problem getting volunteers starting at 8:30 a.m. the following morning. In the days that followed, the Red Cross arranged for temporary living quarters for visiting relatives to stay. Some model railroaders even took people in. The convention continued with the some changes. The banquet that Saturday evening was a somber event with discussions of the wreck. The 15th Anniversary Party scheduled for Sunday night in the Hotel Schroeder's Crystal Ballroom [now a Hilton] was cancelled. Clinics and business meetings scheduled for Sunday went on as scheduled. NMRA Charter Member Grant Oaks (who was president of the O scale Model Railroad Club of Milwaukee) along with Jim Grace, were co-chairman of the convention which had a committee of 24 members. Grant and his wife had celebrated his 33rd birthday on September 1 with another couple attending the convention. A day later he told the wife of that other couple that her husband had been killed in the wreck. Before the weekend was over he had informed about a half dozen spouses that their husbands had been killed. Others were a bit lucky. A then teenage Richard Cecil, overslept that morning and missed the excursions (he went on to serve as past WISE Division superintendent, MWR auctioneer and 1985 NMRA convention general chairman.). The lightweight 39-40 were so badly damaged they were rolled down the embankment and later scrapped on site. The heavy articulated 1192-1193 was towed back to Milwaukee and eventually stored at the Waukesha Gravel Pit, never to be rebuilt. By 7:00 p.m. that evening the line had been cleared. But clearing the line did not stop Speedrail's problems. Two days later freight motor 1121 and car 64 collided at almost the same location which resulted in one injury - passenger Ewald W. Rintelmann, 50, of Hales Corners, was shaken and bruised. Then the line's primary insurance carrier notified Speedrail that their insurance would be dropped. But Milwaukee Mayor Frank Zeilder (also an NMRA charter member) [Frank passed away in 2006] stepped in and after a nine-hour negotiating session between the line's management and insurance representatives had the insurance renewed before service was suspended. According to Grant, Al Kalmbach (who was also chairman of Milwaukee's Transportation Committee) chaired an emergency committee of 10 members from across the country after the wreck and kept everyone focused and calm. As with any accident, the liability issue soon arose. Speedrail only carried $500,000 in liability insurance. The NMRA dodged a potential financial disaster in that tickets for the trip were purchased directly from the Speedrail ticket windows, so the Association was not liable. Under Wisconsin law, had the NMRA bought the tickets and then resold them, the NMRA would have been a "vendor" of the trip and would of been co-liable in any lawsuits. There were four independent investigations into the wreck by the Milwaukee Country District Attorney's Office, the Milwaukee County Medical Examiner's Office, the Wisconsin Public Service Commission, and Speedrail. An exact cause was not determined, and Maeder was acquitted of all charges, although according to his family he was haunted by the accident for the rest of his life. Despite numerous reorganization efforts and campaigns by riders to save the line, the last day of Speedrail operations was on Saturday, June 30, 1951 with car 63 making the last round trip to Hales Corners that evening. In the spring of 1952 dismantling of the line was started by the Hyman-Michaels Company, a scrap dealer from from Chicago. 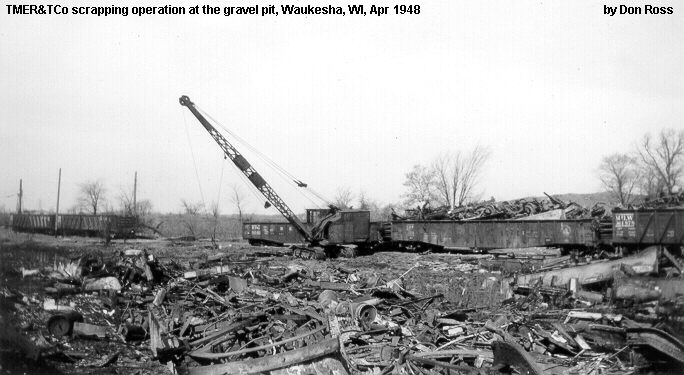 The remaining cars were scrapped at the Waukesha Gravel Pit in March of that year, and in 1961 Speedrail was dissolved. Jay Maeder moved back to Avon, Ohio and took heavyweight 1138 and former Kansas City Birney 1545 with him. He died of cancer in 1975 at the age of 67. Another car was donated to a rail museum in Worthington, Ohio. Ironically, the Speedrail name almost rode the rails again in the form of a proposed very high-speed rail line from Sydney to Canberra, Australia. But that plan was dropped around 2000. The Milwaukee Journal from September 2 through September 6, 1950. Pages designed, written, and hosted by Joe Russ, WISE Div., NMRA. Copyright © 2005 - 2012 by Joe Russ. Updated 8/31/12.